Not all the VC10s built were fliers. 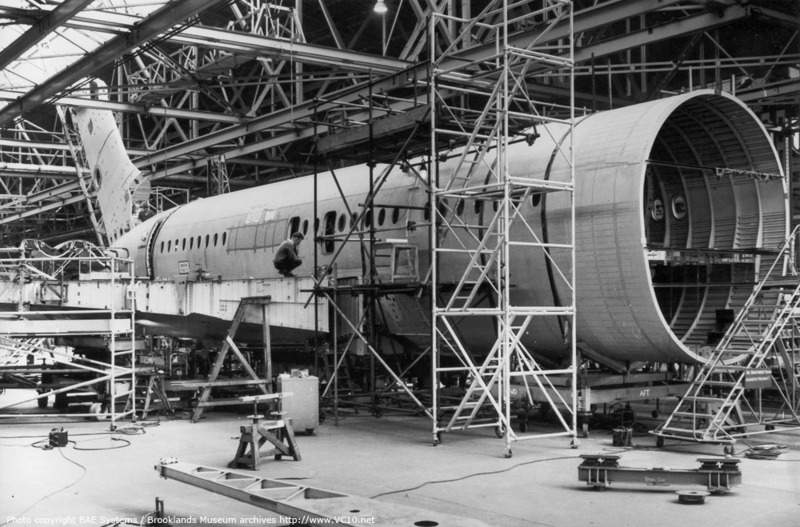 In the development of large airliners - and the VC10 is still the largest airliner built solely in the UK - it is normal for complete aircraft to be constructed for the sole purpose of taking them apart again, obviously after testing has been carried out. The VC10 was no exception to this rule. 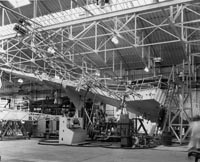 Looking at the production list for the VC10 it is easy to see that the first two construction numbers on the list never came close to a buyer or even an operator, these are the test fuselages constructed. But the story of the 'testing times' starts earlier; with the mock-up. 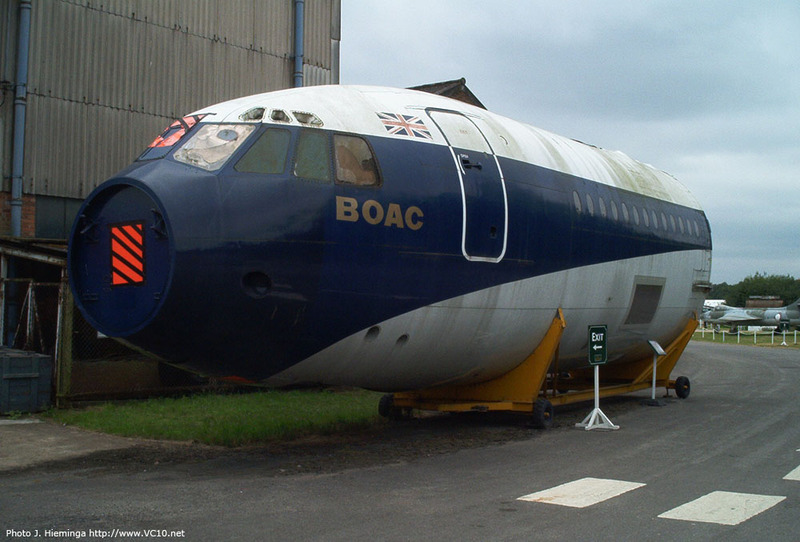 The full-scale wooden mock-up of the VC10. 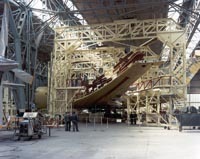 The aft-fuselage mockup under construction. The sign states that the fuselage datum of the real fuselage is 12 feet above ground level while on the mockup this is only 7 foot 2 inch. In aircraft design the mock-up has an important place. In these modern times they are often made using plastics but in the VC10 days wood was the material of choice. 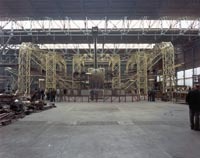 The purpose of the mock-up is to transfer the ideas from the drawing board to the production line, and as such it is an important aid to designing an aircraft. It enables the engineer to plan in three dimensions, and provides a check on the layout of the thousands of integrated components which make up an aircraft. Besides this, it also serves as a demonstration of layout possibilities for the customer. Sometimes it is only in the mock-up stage that important decisions can be made. Specific dimensions in cabins, galleys and cockpits can easily be set on a drawing but until you can find out for yourself if a cupboard is set at the right height you cannot be sure if your design will really work when used on a day-to-day basis. Because of this the mock-up can get quite crowded as it is being built with many different designers wandering about, checking on the feasibility of their ideas or complaining about someone else's air-conditioning ducts positioned just where they wanted to put a box full of electronics. 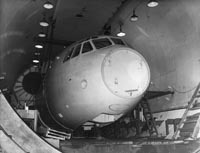 As an example, the VC10 mock-up featured a fully equipped flight engineers station which was used for night lighting trials amongst other things. Besides the complete mock-up that is pictured on this page, a separate mock-up was built of the freight door for the RAF version of the VC10. 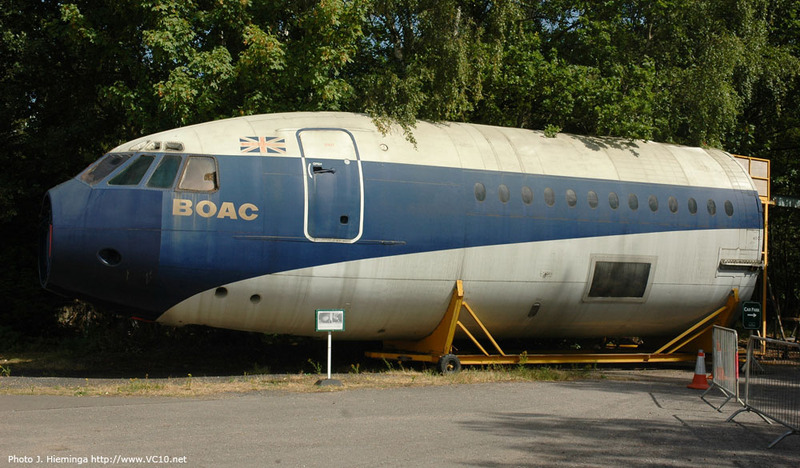 This was probably used to test the size of the door against many different types of military cargo that the VC10 was destined to carry. 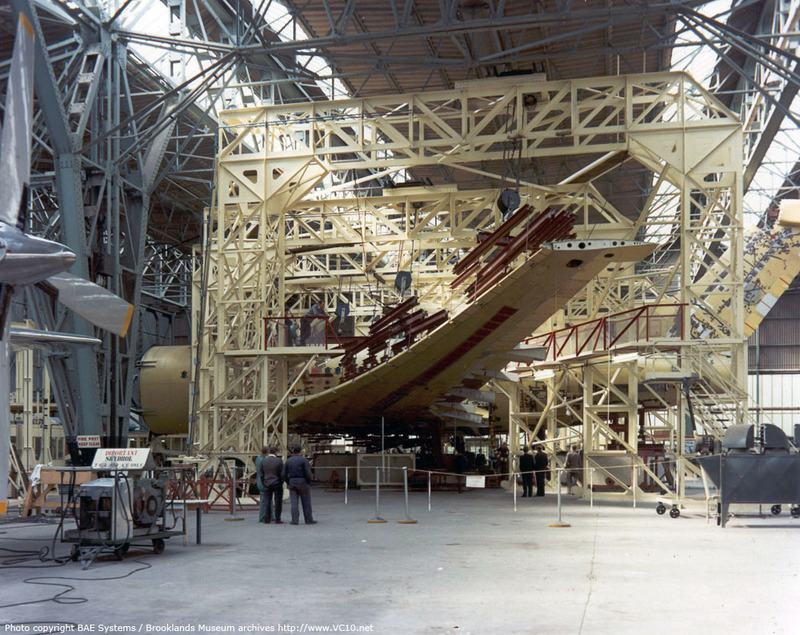 The mock-up for the VC10 was set up, together with the 1-11 mock-up, in the mock-up hangar at Brooklands, or to use the official terminology: British Aircraft Corporation - Weybridge division. 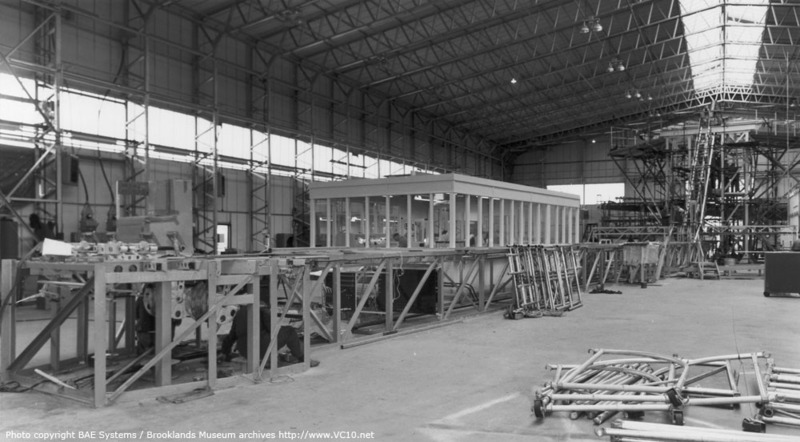 This mock-up hangar was a wartime structure that is positioned on what used to be the 'Finishing Straight' of the pre-war Brooklands racing circuit. This hangar is still in existence as the sole survivor on the Brooklands site. The ex-mock-up hangar is now the main hangar for the aircraft collection of the Brooklands Museum, and as such provides shelter to: Wellington R for Robert, the Vickers Vimy replica, Harrier G-VTOL and several other aircraft. 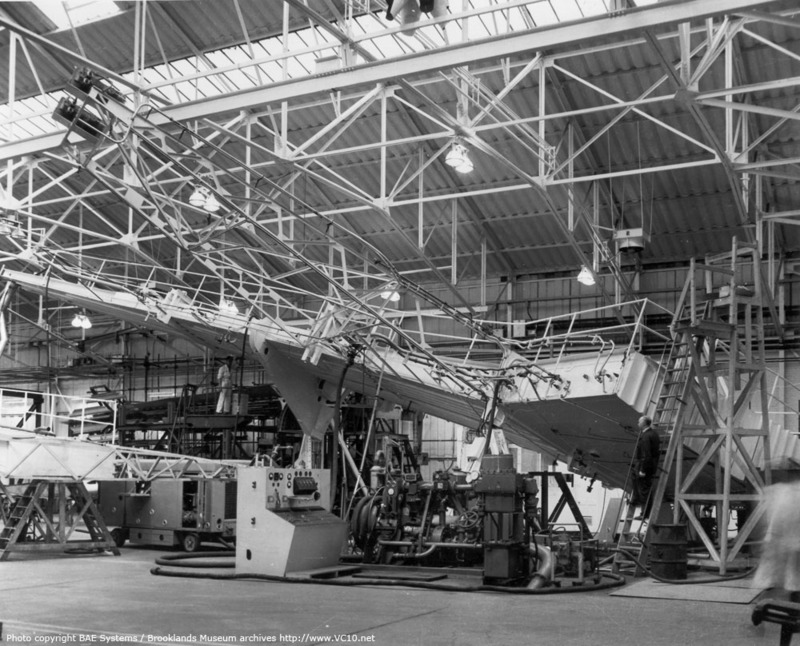 Two forward fuselage test sections were constructed for the VC10 in 1961. Both consisted of a section from the forward bulkhead to (approximately) the back of the forward freight hold. C/n 801A is a test section without a main deck cargo door. This test section is preserved at the Brooklands Museum as detailed below. C/n 801B is believed to be s a similar test section but with a large main deck cargo door. This section was only used for water tank testing and has not been preserved. The test sections were used to validate the fuselage design for the maximum pressure differential of 9 lb/sq in. There are two cases to validate here, the first being the maximum attainable pressure differential before failure, and the second the fatigue problems arising from the repeated pressurization cycles during it's life. 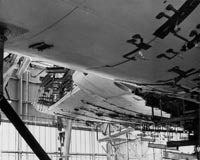 To test the VC10's ability to withstand these problems Vickers had an excellent tool in the Stratosphere Chamber designed by Barnes Wallis. In the 'Strat Chamber' altitudes up to 80,000 feet could be simulated and thus the fuselage would be subjected to the same forces it would experience during its service life. Initially the fuselage carried out tests in a water tank as a failure in a water tank will be safer for the surrounding test equipment (including the personnel). In one of these tests of the forward fuselage section it was pressurized to failure, this occurring on a skin line between the side and top fuselage skin panels on the left side of the section. It was repaired and then tested for fatigue in the Stratosphere chamber. 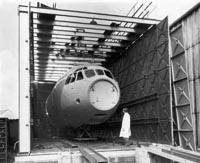 The fuselage section was used for a variety of other tests until the mid-1980 after which it was donated to the Brooklands Museum by the British Aerospace Weybridge factory in 1986. 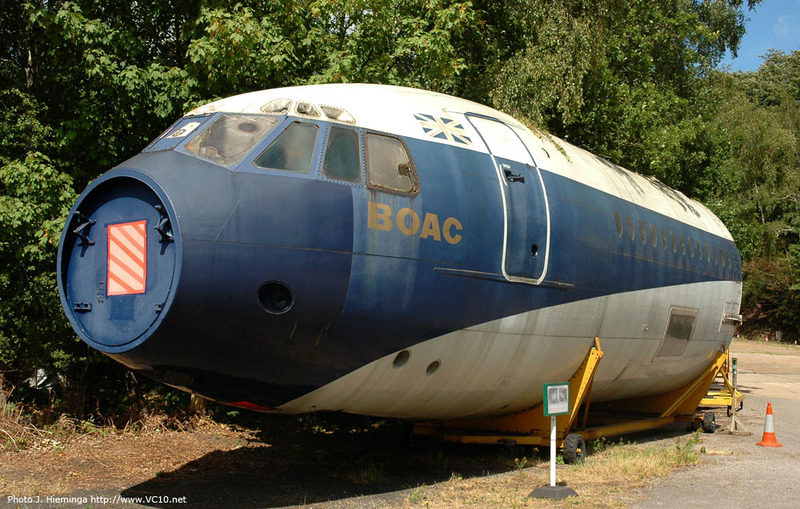 In 1992 the fuselage section was repainted in BOAC colours by British Airways. 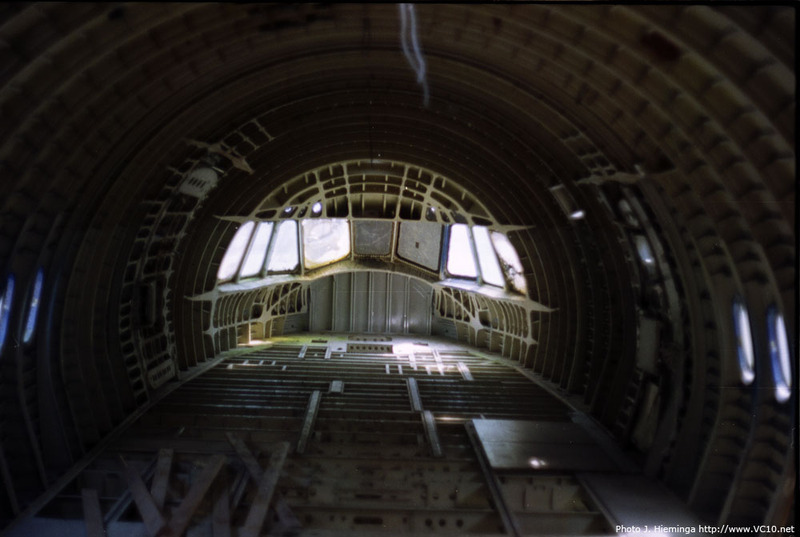 This was not the end of its days as a test article though as RAF St. Athan borrowed the fuselage section in 1996 to test a front bulkhead replacement. 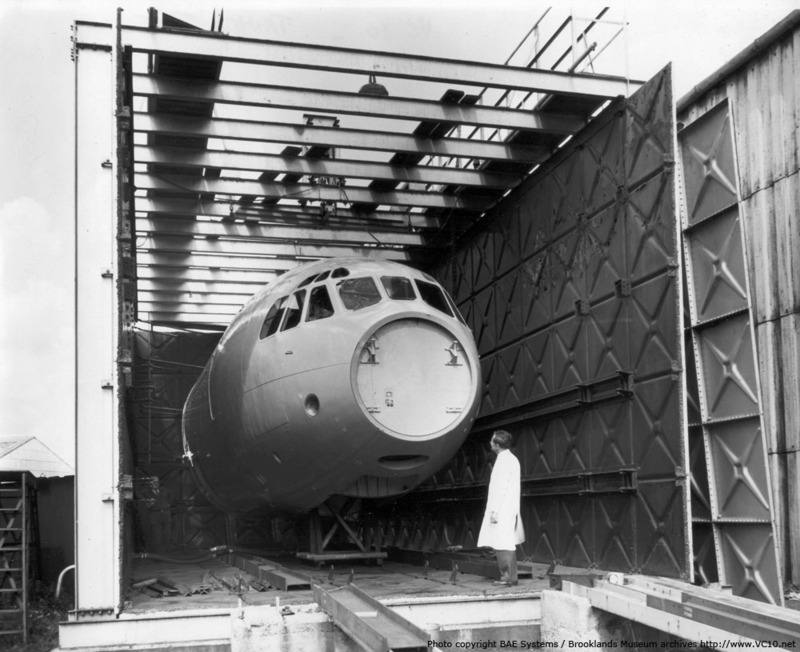 In return they made the fuselage section fully weatherproof, fitted perspex viewing panels to the underside of the section as well as cabin windows, and they also supplied the trailer on which the fuselage rests. The test section shown on 16 August 1961. The test section in the Barnes Wallis' designed Stratosphere Chamber. Emerging again after a series of water-tank tests. 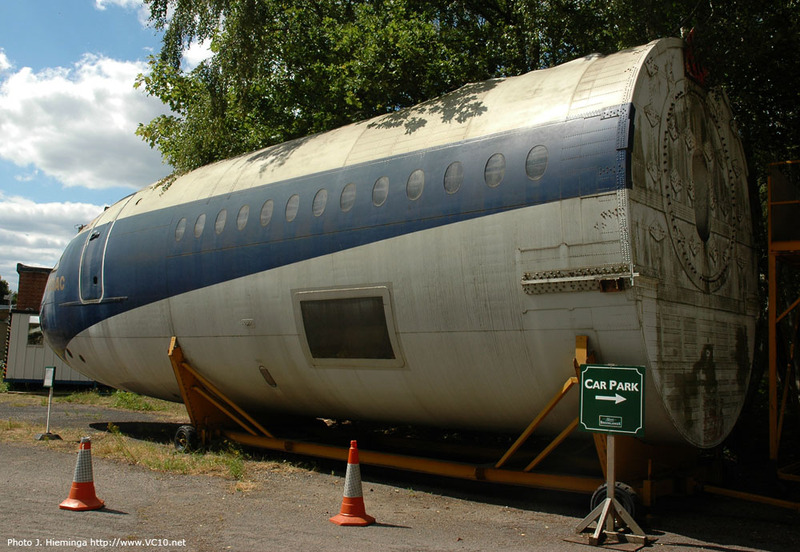 The forward fuselage test section for the VC10 as it is preserved at the Brooklands Museum, seen in 2002. This photo was taken in 2010 and shows that the paint (which was applied in 1992) is fading by now. Compare this view from 2010 to the photo on the left and it is clear that the test section is in need of a touch up. 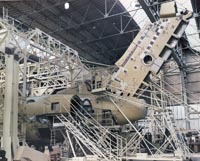 The aft end of the test section is closed off with a bulkhead which does not reflect any part of the aircraft's normal structure. In this close up the panels which failed when the test section was pressurised to failure are visible at the top. Looking at the fracture from above shows that it is typical for a water pressure test, a small skin fracture with minimal skin deformation. If this test had been done with air pressure the expanding air would have pushed the skin panels apart and caused more damage. 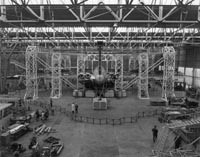 The airframe that was constructed for structural testing was not a complete airframe as it lacked the nose of the aircraft. It did however include the complete wing torsion boxes on both sides. 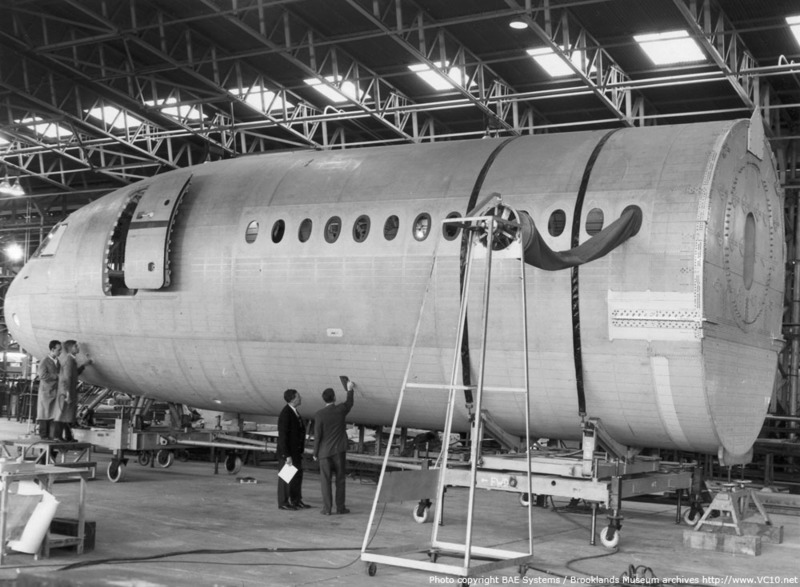 This was a necessity as this airframe would be used to validate other features of the VC10 structure; the wings and centre section as well as the wing to fuselage attachment points. "A complete VC10 airframe has been built for static, fatigue and fail-safe tests. This picture was taken just before the successful completion of a proof load test (two-thirds of ultimate) which preceded first flight. At the proof load - equivalent to a 2½ g manoeuvre at 256,000 lb weight, 1,000 ft altitude and 330 knots equivalent air speed - there is a deflection at the wing tip of over 8 ft."
The airframe was held down by several concrete blocks which were attached to the fuselage underside and the forward end through a steel frame and cables. This represented the weight of the airframe and the load carried by it, while the aerodynamic forces were applied through a multitude of pads which were firmly affixed to the top of the wings. 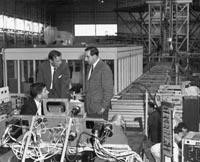 Power for the whole test rig was supplied by a six-cylinder diesel engine which drove hydraulic pumps. 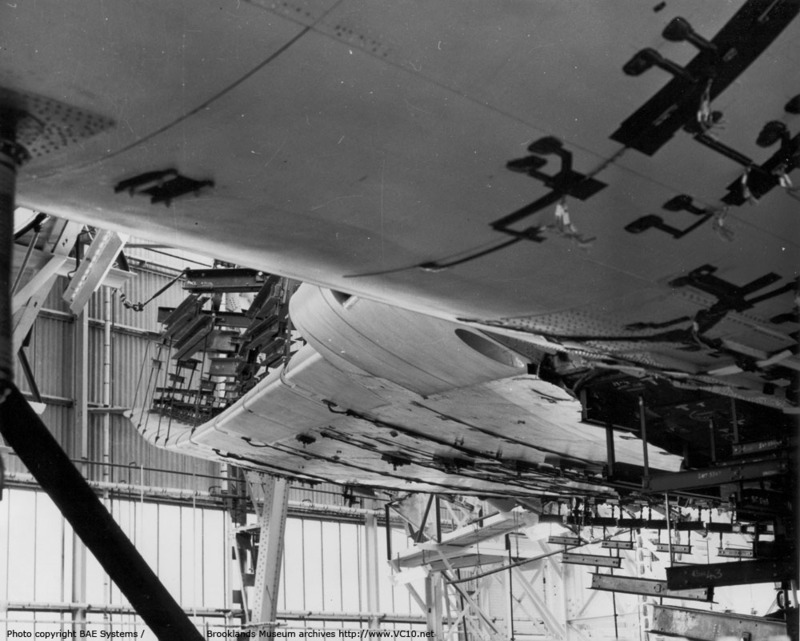 A large array of pipework and valves transmitted the hydraulic pressure to several jacks which pulled the wings up through interconnected beams and cables, thereby simulating the lifting force on the upper wing surface. 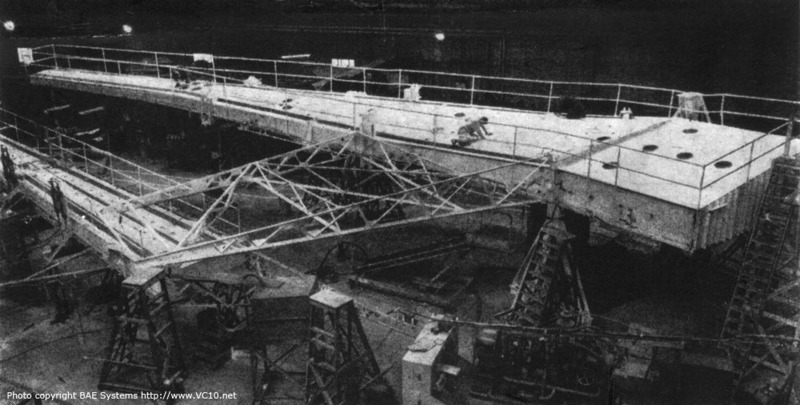 The test rig was controlled from a room in which the various pressures could be monitored as well as the stresses measured in the airframe, for this purpose several large plotters were running. 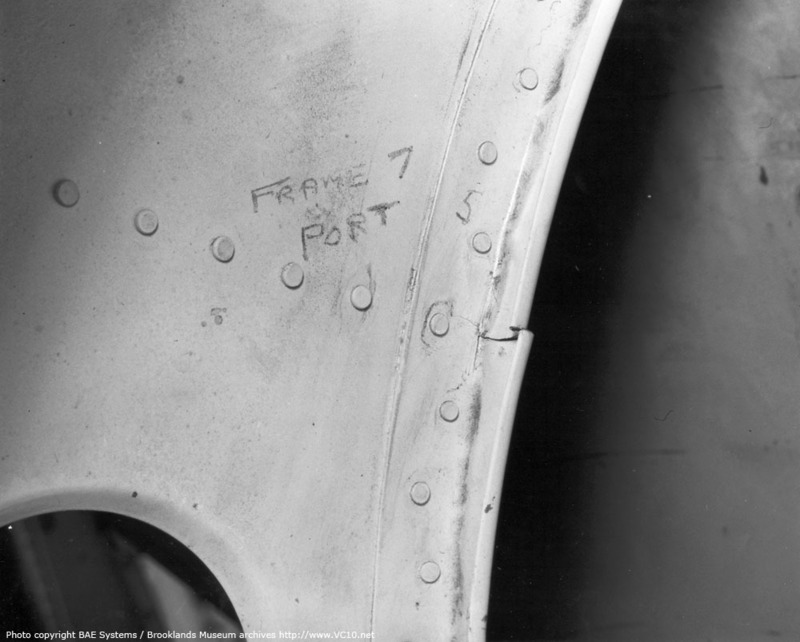 A monitoring room was next to the right wing leading edge and this featured readouts for some of the pressures and stresses and also a relative safe place from which to observe the airframe during testing. A separate tailplane was also subjected to these tests in a smaller setup. 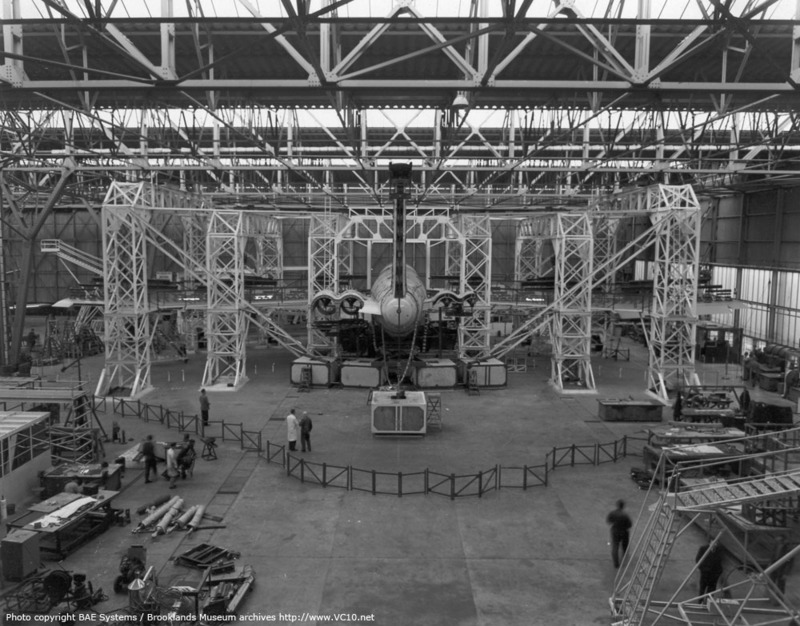 After the static load testing was completed the airframe was subjected to a representative fatigue program in which alternating loads were applied to check out how the structure would 'age' during its life as an airliner. 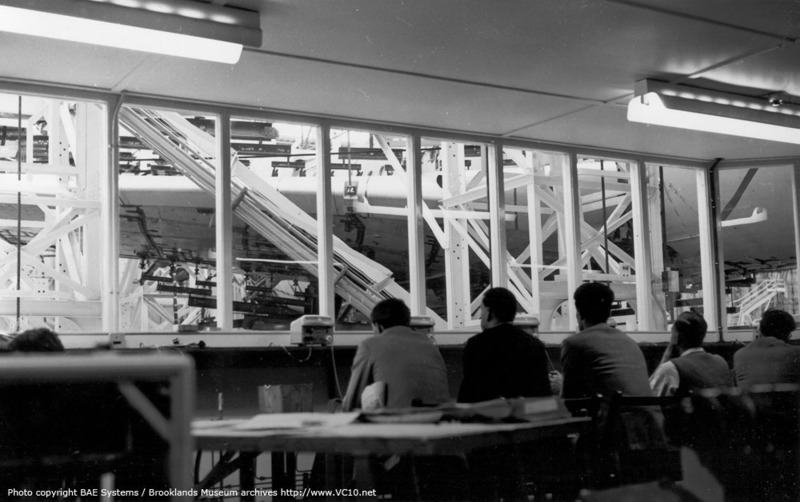 The final batch of tests were fail-safe tests in which alternate load paths throughout the structure were validated. The fail-safe principle states that in the event of a failure in the structure a second load path must be able to withstand the design load on the airframe, allowing it to operate in safety until regular inspections allow the failure to be rectified. 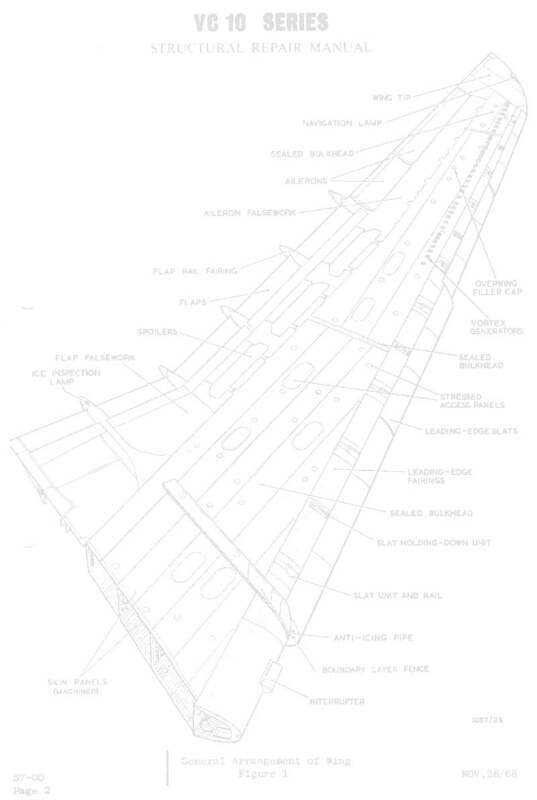 The eventual fate of the test airframe is unknown to me, but as a spare VC10 airframe would probably not go unnoticed in someone's backyard I'm guessing that it was scrapped after testing was complete. 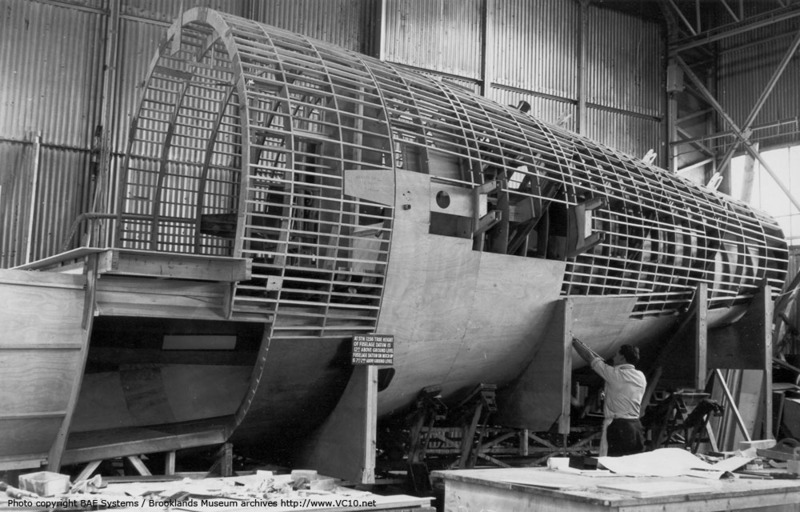 The structural test airframe was moved to Wisley and mounted in what was known as the 'Cathedral frame'..
All the rectangular patches on the fin are mounting points which are glued to the skin so that a force can be applied to the fin structure through it. The text accompanying this photo is reproduced in the text above. Compare the wing deflection with the previous photo from this viewpoint. The wing deflection during tests such as these is very large, during normal operation the aircraft stays well away from this corner of the flight envelope. Looking at the wing from underneath the fuselage shows the curve of the leading edge, also visible are sensors mounted on the fuselage skin to measure the local stresses. From the monitoring room test engineers kept an eye on the various stress gauges and the airframe itself for any signs of problems. 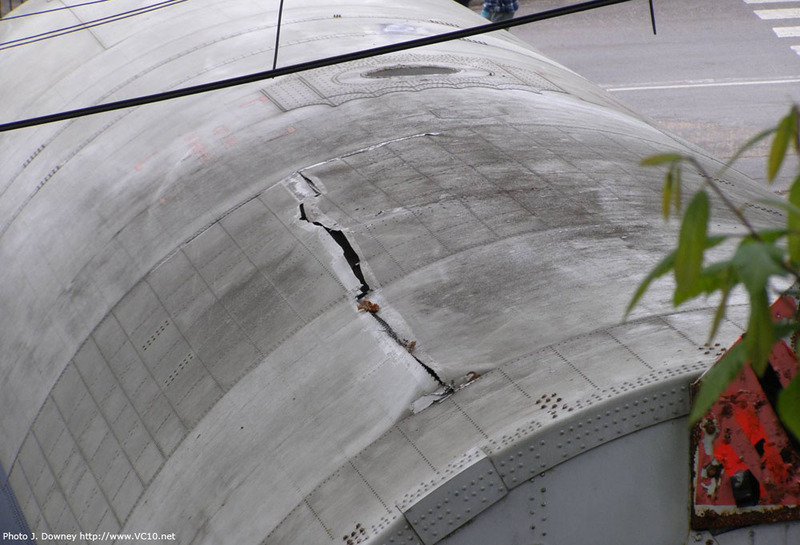 Not everything survived these test, here a small fracture is visible in a fuselage frame. Results like this told the engineers which components needed strengthening in the final configuration. 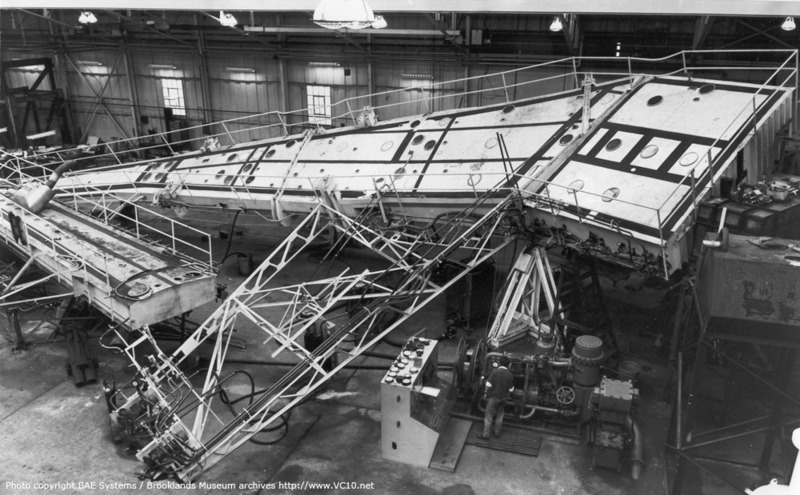 To test the fuel-feeding properties of the wing tanks a complete left wing and center section was constructed from mild steel as a test rig for the fuel system. With a test rig like this it is possible to tilt the wing and figure out whether the fuel will feed to the engines under all flight conditions. Optimal locations for fuel pumps can also be verified from this rig, and the amount of unusable fuel can be determined. The fuel lines to the engines but also refuelling points were included so that every conceivable situation could be simulated. 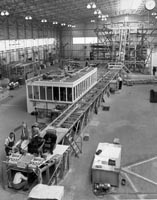 The VC10 fuel test rig being constructed, a similar rig for the Vanguard can be seen at the left. The difference in size is obvious. The rig seen during testing, the structure on the left front is there to hold the fuel lines to the engine location so that fuel pressures at the engine can be checked. In this photo the rig simulates a nose down situation. 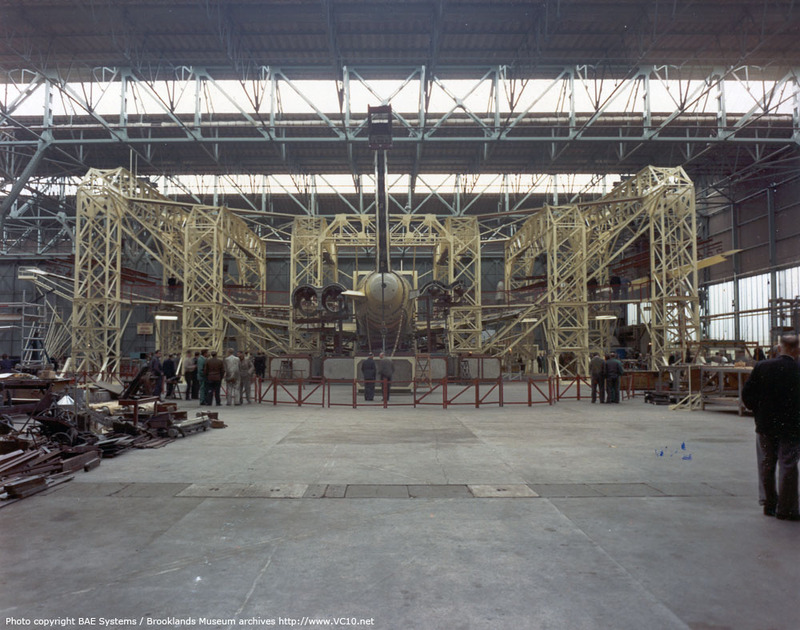 Not just the structure of the VC10 was tested, various other rigs were constructed for the systems that would enable the crew to safely operate the aircraft. 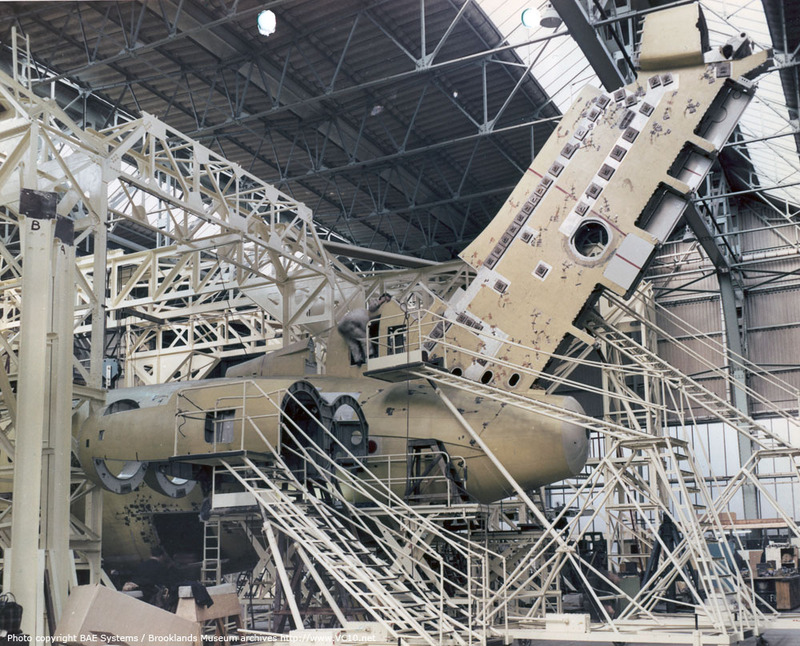 One of the largest of these was the flight control test rig which featured a full size representation of the airframe with all the moving surfaces, control cables, Power Control Units (PCU) and a complete cockpit with all the relevant controls and indications. The test pilots who would carry out the first flight spent quite a lot of time in this rig trying out the controls and practicing the emergency drills which would be needed if for example a PCU would fail in flight. 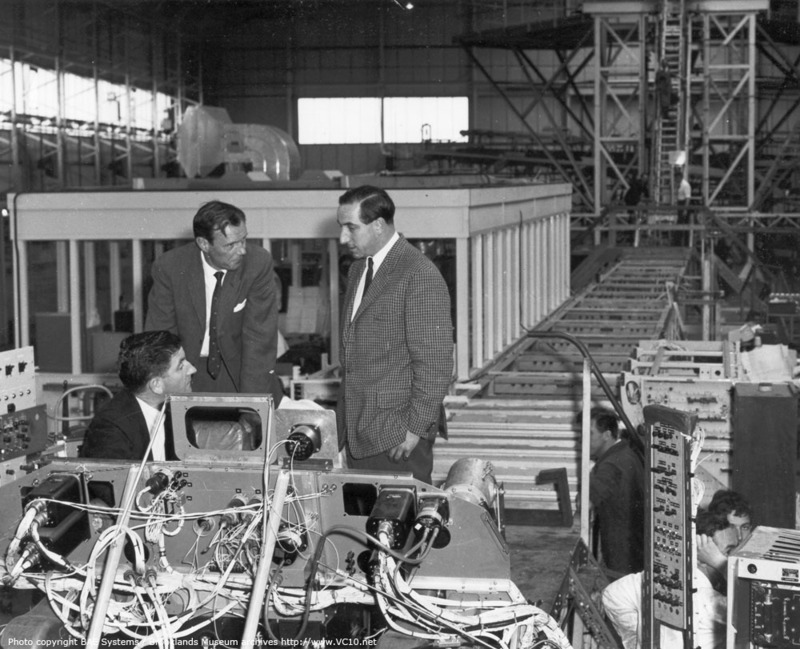 Another important decision which was made by them was how much friction was acceptable in the flight control system. Any control system with cables has a certain amount but it was up to the test pilots to decide whether it would impair the pilot's ability to safely control the aircraft as too much friction can actually make an aircraft unstable, as well as increase the work load of the pilot. 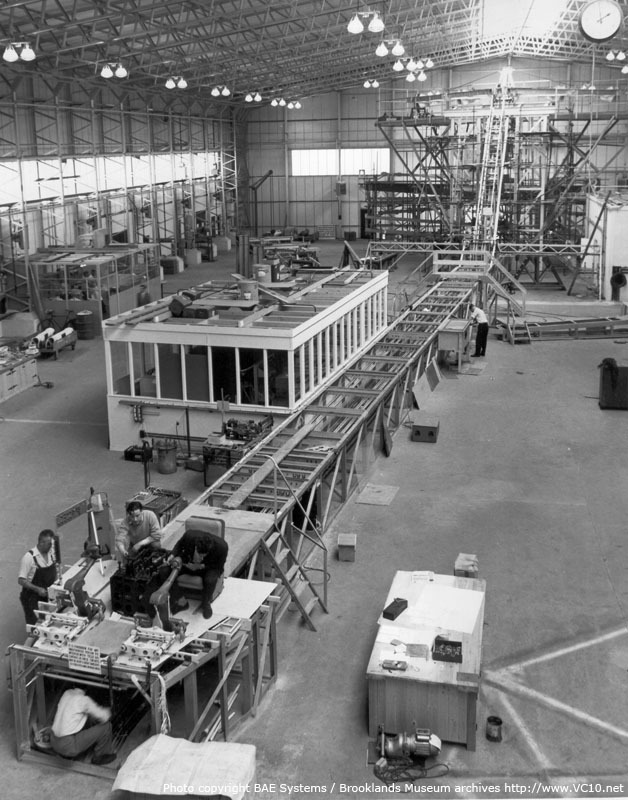 The flight control rig seen during assembly on 2 May 1961. An overview of the complete rig which is by now a bit more complete. Brian Trubshaw is in the co-pilot's seat with Jock Bryce in the captain's seat next to him. The flight crew who would carry out the first flight, Jock Bryce, Bill Cairns and Brian Trubshaw together on the 'flight deck' of the test rig.